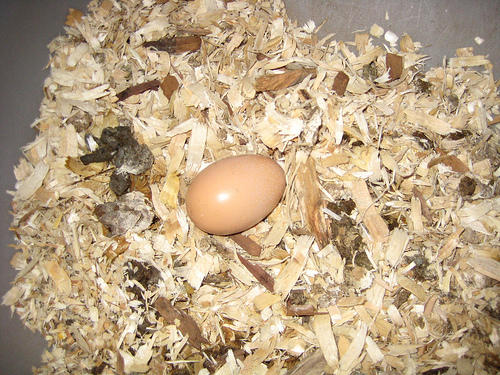 Urban Chickens Network blog: Stop washing your eggs! It's hard to resist making eggs pretty when they're removed from the nest. But washing your urban chicken eggs is just about the worst thing you can do to them. The first few eggs we got from our hens, I promptly took them out of the nest and straight to the sink to wash off the dirty bits. Can't have any feathers or dirt (or poop!) clinging to the outside of the egg, nosirree. A clean shell means a good egg, right? Wrong. My desire to have clean shells was born of all those years buying eggs in the store. My mother taught me to always open the carton at the shelf to see if there were any cracks or breaks or other reasons to try another carton. And I learned that a carton full of clean white shells meant they were good eggs. And good eggs were always refrigerated properly, just like it says on the carton. Fast forward to my urban chicken years, and I've come to learn something very, very different about eggs farmed from the backyard: once the egg is removed from the nest, there's really no intervention required. Not even refrigeration! Why? Well, just before the fully-formed egg passes out the vent of a hen, her body adds a moist, protective coating called the bloom. This wet bloom dries quickly when the egg lands in a nest and it becomes a protective shield, covering all the pores in the egg so bacteria and dirt (and even air) can't get inside the egg. The bloom also traps moisture inside the egg so the yolk and albumen don't dry out. This coating is why eggs can be left out at room temperature for weeks, if not months, and still be edible. This coating is also why a hen can save for several weeks to keep a clutch of a dozen eggs or more in her nest before sitting on them to incubate them into little chicks. When we wash eggs, we actually remove this bloom, this protective coating, from the shell and at best, make it possible that air gets into the shell and degrades the albumen and yolk (making them runny and less nutritious). At worst, we're effectively pushing the bacteria that was outside the egg shell through the pores and into the inside where it wreaks havoc until we open it. This havoc is only slowed down by our refrigerating the eggs. So what to do instead of washing your eggs? Try keeping a bit of sandpaper by the coop to sand off any stuck bits. Or a fingernail brush to brush off bits of nesting material, feathers or poop. Just do your best to keep your eggs dry and the bloom intact so nature can protect your eggs as they sit beautifully on the counter. And if you must, must, must wash them? Do it just before you eat them. What about temperature though? I like the idea of leaving the eggs on the counter in a basket; but here in the South, summertime temps can reach into the 90s daily. This fact is a very difficult one to convince people about. You've done a great job with this information and I shall forward it to some of my naysayers. Great article! We only ever wash our eggs if they are really dirty and as you said just before we eat them. They sit in an egg bucket on the side in the kitchen. We live in the North of England though so it never gets that hot. Hi Linda, remember that chickens have been laying eggs since long before we've had refrigeration, so even though the temperature is hot, you can still keep them on the counter. If you're really feeling skittish about keeping them cool, go ahead and stash them in the fridge, but just don't feel you need to wash them before you do.